Since 1965, Atlantic Coast Precast has supplied North Ridge Annex with Concrete Vent Blocks to home and business owners as well as design and construction industry professionals in and around the that can enhance any architectural style. Precast materials strengthen over time, adding a reliable durability to the installation. Available in many options, there is a color and style for every application. 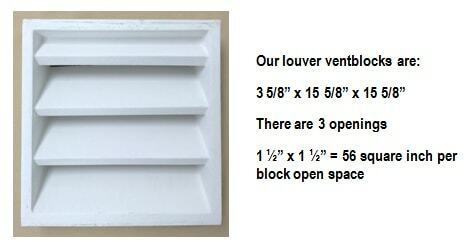 Our professional team manufactures and installs concrete vent blocks and more. For more information and to get started on your free consultation, give us a call to day and speak with one of our dedicated team members! A variety of shapes, sizes and colors are available in North Ridge Annex with Concrete Vent Block options to suit any style or design preference. Functional as well as as design enhancement, our two piece vent blocks are a great solution to provide cross ventilation in otherwise stuffy areas in garages, foundations, and range hoods. This method of providing cross ventilation also helps to prevent damp rot, which is caused by trapped excess moisture. ;Homes and businesses benefit from our concrete vent blocks by allowing fresh and dry air to circulate. In North Ridge Annex, concrete vent blocks can be your first line of defense against mold and mildew that forms due to lave of circulation of fresh air. Foundation vents and exterior vents can be installed to provide this added functionality while also enhancing the appearance of your building. Atlantic Coast Precast, serving our area since 1965, also provides options cast as a single solid piece for those installations when the ability to ventilate is not needed. Give us a call today to learn more from our dedicated team!